2 or 3 bedrooms, sleeps 4, 6 or 8 people. The moulin is set peacefully in seven hectares beside a river, 5 kms from the village of Laignes in the Châtillonnais wine growing area of the Côte d'Or, close to the Chablis vineyards. Built at the end of the 18th century, the moulin has now been made into three large, completely independent gites, each with its own aspect, character and privacy. The village has essential shops and there is a larger selection in Châtillon-sur-Seine, a pleasant market town with avenues of plane trees and limes, on the banks of the young River Seine. The start of the Champagne region is a twenty minute drive from here. Paris is 90 minutes away. The moulin is within reach of some of the treasures of Burgundy; the Abbeys of Fontenay and Pontigny, the châteaux of Tanlay or Ancy-le-Franc and lovely medieval villages such as Flavigny and Noyers-sur-Serein, as well as the great wines and the food. As much of the original charm as possible has been preserved in the three gites and they are each comfortably furnished with Burgundian country furniture. Staple basics such as milk, coffee, salt, pepper, sugar etc are provided in each gite and a travelling chacuterie/butcher with local cheeses, meat, hams and salamis, visits once a week. There is also garden furniture, hammocks, boules and barbecues, and row boats. The gites may be taken either separately or together. Le Pommier has a large kitchen and dining area equipped with, amongst other things, a dishwasher and washing machine, an oven and hob and a fridge/freezer. The living room has a log fireplace and satellite television. There are two bedrooms, one double and one twin and a bathroom with shower with a separate wc. Outside is a courtyard and a private garden. La Vigne has an open plan living room and kitchen/dining area with a corner wood burning stove and satellite television, which opens on one side onto a covered terrace and private garden. 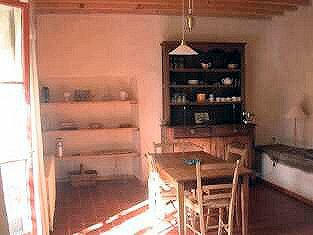 The kitchen is also fully equipped and includes an oven and hob, fridge/freezer and dishwasher and washing machine. It has three bedrooms, a twin bedroom on the ground floor and a double bedroom and another twin upstairs, along with a bathroom with shower. 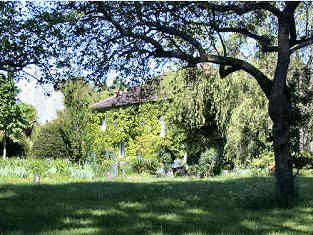 L'Eau is the largest of the three gites and has a entrance hall and a salon with an open fireplace. The kitchen, like the others, is equipped with a large oven, a microwave, dishwasher and washing machine and fridge/freezer. 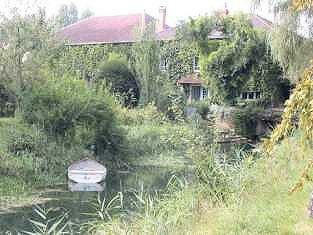 The gite also has satellite television, a card telephone and a CD player. 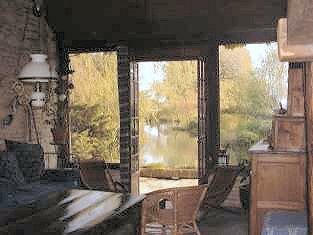 The winter garden overlooks the river and serves as a dining room, (with a spare bed if needed) and there is a bathroom with shower and a separate wc. Upstairs are three other bedrooms, a double and a twin bedroom and a third bedroom with a double and a single bed. The bathroom has a bath and a separate wc. Outside is a terrace and a private garden leading down to the river. 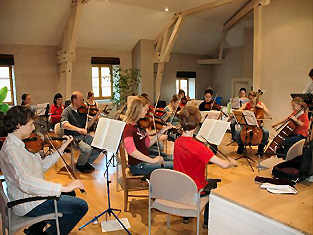 We have a large salon available for groups staying in all three gites, as a work space for those who wish to rehearse music and dance, or give painting, yoga or meditation classes. There is also a gym and a sauna. An extra bedroom with a bathroom and a small salon with a corner kitchen is also available. See below for prices. Natural countryside surrounds the moulin; forests and lakes, vines and meandering country lanes, where you can walk or cycle for miles. There are riding stables nearby, places to fish on the rivers and lakes and a golf course 20 kms away. Most of the villages have weekly markets with fresh fruit and vegetables that change with the seasons. There are stalls with six varieties of onions and wild mushrooms, others with cheese, honey and a dozen different kinds of Dijon mustard. Burgundy's devotion to food has not diminished and the region has more one, two and three star restaurants than almost anywhere in France. There are fermes-auberges where you can eat ten year old pâtés with fresh crusty bread and hot leek soup with wine and snippets of pork. Tuck a napkin under your chin and splash into a bowl of écrivisse, gorge on well hung snipe, roasted then served on cushions of toast softened with pâté and brandy. Chablis (45 kms) is a small, attractive medieval town, which lies at the centre of its vineyards and entirely devoted to wine, best sampled with gougères, crusty cheese pastries, or at lunch with fish or snails. First planted in the 12th century by Cistercian monks, the wine falls into four distinct appellations grown in a constellation of hamlets around the town. The grand crus are grown on the sunny slopes overlooking the town and the main domains are known as the magnificent seven. A little further south is Noyers, a timeless medieval town set on the banks of the river Serein. Around every corner are cobbled streets and houses with sculpted Renaissance motifs, squares with sloping half-timbered houses and delicate arcades. 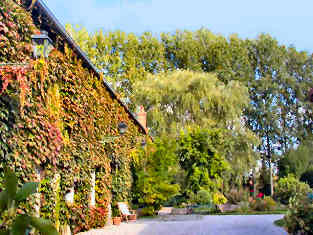 A gateway at the end of the town leads out to fields and pretty wine growers cottages. The great Abbaye de Fontenay (20 kms) is at once supremely mystical and functional. Unadorned, its beauty lies in its architectural proportion, which reflects mathematical design and Christian numerology. The bare facade is pierced by seven narrow windows, a sacred number symbolising perfection, and the fusion of heaven and earth is echoed throughout the interior. Perhaps Burgundy's greatest Cistercian church though, is Pontigny. Built between 1150 and 1212, an avenue of linden trees leads to the sober west porch but nothing prepares you for the blinding whiteness of the stone inside, bleaching out detail and directing the spirit inwards.